This article is about the MLB pitcher who played from 1967-81. For the outfielder who played from 1981-91, see Mike Marshall (outfielder). Michael Grant "Iron Mike" Marshall (born January 15, 1943) is an American former Major League Baseball pitcher. He played in 1967 and from 1969 through 1981 for nine different teams. 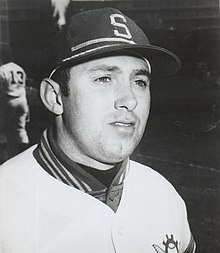 Marshall won the National League Cy Young Award in 1974 as a member of the Dodgers as well as being named the NL Pitcher of the Year by The Sporting News. He set a Major League record for most appearances by a relief pitcher in 1974, appearing in 106 games. He was a member of the National League All Star Team in 1974 and 1975. Marshall was also named Fireman of the Year by TSN with three different teams: in the NL in 1973 with the Montreal Expos and 1974 with the Los Angeles Dodgers, and a third time in 1979 in the American League with the Minnesota Twins (sharing the award with Jim Kern). He was voted the Montreal Expos Player of the Year in 1972 and 1973 and was also an original member of the Seattle Pilots. Marshall, who relied primarily on an elusive screwball, led his league in games pitched four times, saves three times, and games finished five times. He is the holder of two major league records, both of which he set in the 1974 season: most appearances (games pitched) in a season (106), and most consecutive team games with a relief appearance (13). He also holds the American League record for games pitched in a season with 90 for Minnesota in 1979. In his record-setting 1974 season, he pitched 208.1 innings, all of which came in relief appearances. He attended Michigan State University, earning three degrees, including a Ph.D. in kinesiology. In the months preceding his 1974 Cy Young season, Marshall considered retiring in order to work on his Ph.D. Marshall eventually would pitch for the Dodgers that year alongside teammate Tommy John. When John went down to injury, it was Marshall who suggested John attempt a radical surgery that would eventually bear John's name. Marshall teaches and advocates a pitching method he developed that he "believes could completely eradicate pitching-arm injuries." He wants pitchers to have a smooth transition. To pitch the arm has to externally rotate (hand lays back) before the ball accelerates. With traditional pitchers the thrower often lifts his elbow before his hand (also called scapula loading); this leads to the ball coming up late and the arm to externally rotate late. The elbow will be accelerated forward while the hand still goes backward, which creates enormous stress on the arm. Marshall instead wants pitchers to externally rotate early as they swing their arm up. That means the pitcher will lift the hand before the elbow, so that the wrist faces away from the body and up, the hand is above the elbow when the front foot touches the ground, which leads to a smooth transition without a "forearm bounce", as Marshall calls it (Marshall believes this causes UCL injuries, which require Tommy John surgery). He wants to first lay back the forearm and then accelerate by rotating the body instead of bending over, in order to protect the elbow against injury. In September 1982—nearly a year after his final major-league game—Marshall was arrested on charges of disorderly conduct and fourth-degree assault stemming from an incident that had occurred outside Marshall's home in Minnetonka, Minnesota. A community dogcatcher alleged that Marshall had used her truck for target practice after she met with him at his house to discuss a black Labrador dog who she believed was his. The dog catcher, Mary Jo Strand, alleged that Marshall had gone into his garage after the discussion, retrieved a baseball and heaved it at her departing vehicle. The ball allegedly struck the top of Strand's truck, landing about two feet from the driver's window. Marshall denied threatening Strand or throwing the ball at her. He also denied that the dog was his. Instead, he asserted that he twice had asked Strand to leave his property and that if she did not do so, he would consider her to be trespassing and would not be responsible "if something happens to your truck", he told the Associated Press. ^ "Mike Marshall Stats". Baseball-almanac.com. Retrieved 2008-06-21. ^ "The Dog Days". Chicago Tribune. September 10, 1982. p. D4. This page was last edited on 18 December 2018, at 06:09 (UTC).